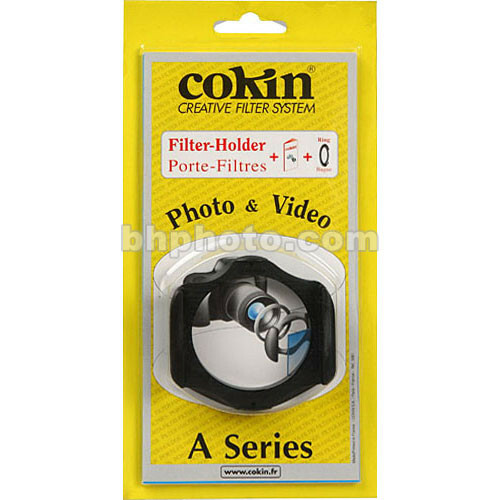 The Cokin A Series Filter Holder is designed to accommodate multiple Cokin A Series Filters in order to help create the shot you envision. It can hold up to three rectangular filters, or two rectangular filters and one round filter such as a rotating circular polarizer, for the Cokin A Series Filter Holders. Rectangular Cokin A Series Filters are 67mm-wide and 1.6mm-thick. A Cokin A Series Filter Holder Adapter Ring can be used to connect this filter holder to the front of a lens. Box Dimensions (LxWxH) 7.323 x 5.354 x 0.158"
A Series Filter Holder is rated 5.0 out of 5 by 1. Rated 5 out of 5 by Teacher 1 from As advertised Durable. Fits well.